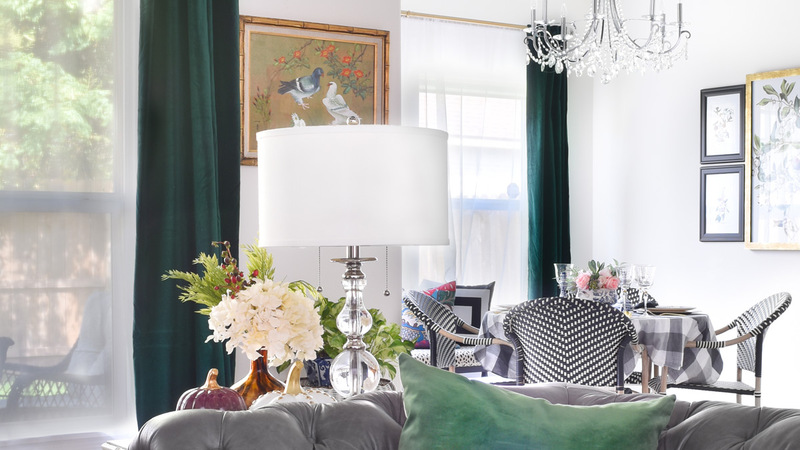 Finding the perfect shade of emerald green velvet curtains (or dark green or dark kelly green…) was no easy feat! 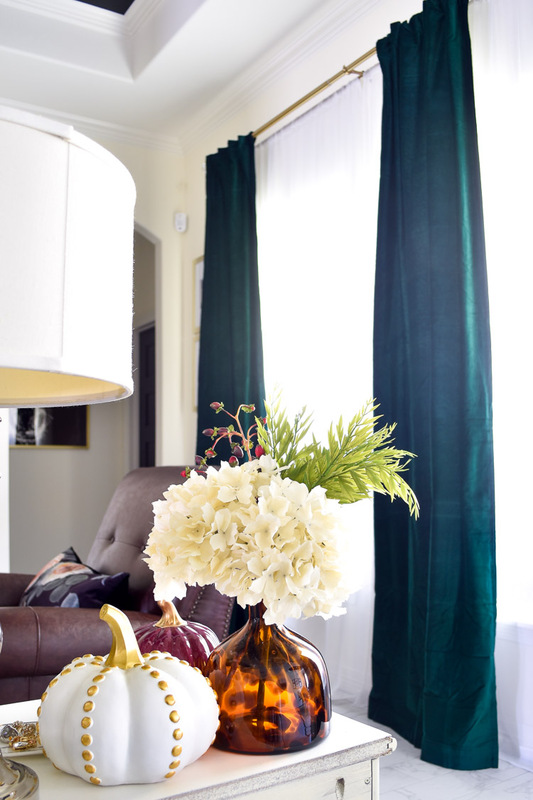 But after nearly a year of searching, I’ve found the perfect, affordable, dark rich green drapery panels for my living room and dining room. You may have seen them in my dining room in my fall home tour, but today you’ll get to see a new few shots from my living room. Affiliate links are used in this post, which means I get a tiny amount of compensation if you buy through my link at no additional cost to you! 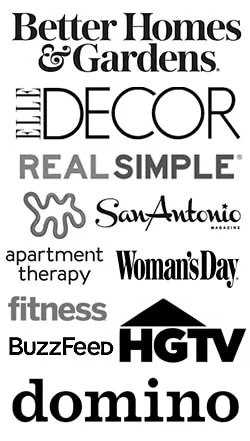 This helps me offset the costs to give you all fab content. Now, I will preface that while I love these curtains, they’re still not 100% what I imagined, BUT I think I didn’t factor in that the way the light hits at certain times of the day will make the emerald green curtains look either a little warmer (more yellow) or a little cooler (more blue). I will say they’re 98% perfect and most of the time they lean green. As it is darker and less light, they lean ever so slightly dark blue green. Here’s a great example of how they look around morning time- the light is a little warmer and they’re decidedly more green. Fast forward a couple hours when the sun is directly over my home, and they get ever so slightly a bit cooler in tone. Not a huge difference, but I’m trying to give you all an accurate representation of these green curtains. And finally, here’s a straight on shot (with me standing directly in front of the bar cart when taking this photo). 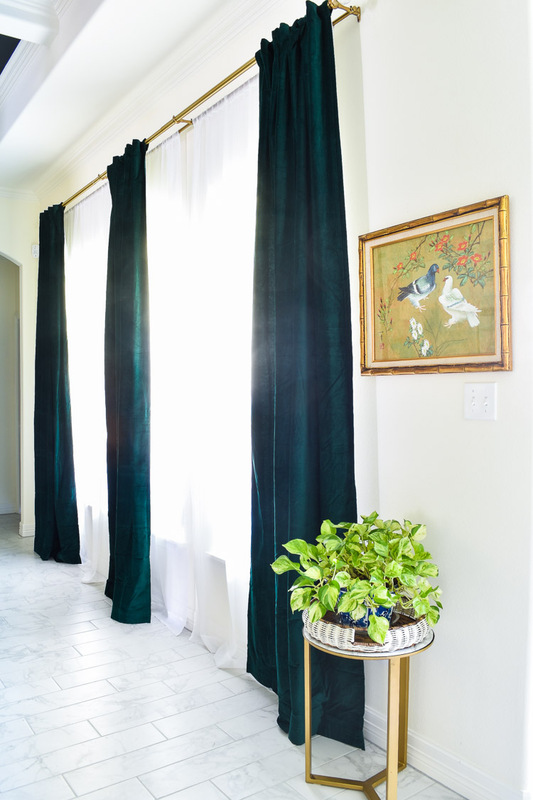 You can see how the exact same emerald curtains look different shades of green due to the light around them. The velvet drapery panels look so crisp and luxe against our white walls, warm gold accents and marble tile floors. And here’s another shot in the living room with me standing near the foyer area. 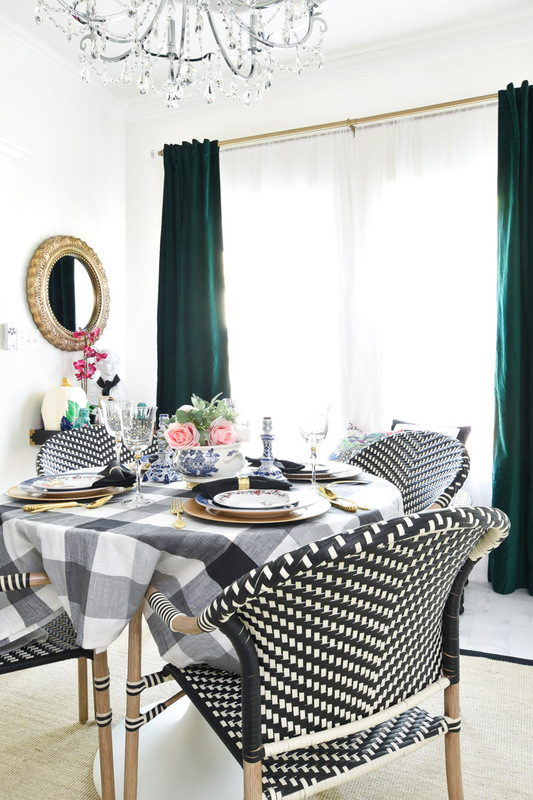 The emerald green color adds a pop of color without dominating the space like the original black and white horizontal striped curtains did. I feel I can definitely treat these as a neutral if I wanted to, or I could go bold with the hue. It’s all in my control. Side note: I cannot wait to get rid of those brown recliners. I am wanting a linen look type recliner that offers some lumbar support for my Netflix binge sessions. And finally, here’s a view of both spaces as seen from the center of the living room. I’m really loving how our living/dining/kitchen open concept space is coming together after a year of living here. I have no regrets on doing this slowly and methodically rather than rushing to get everything done ASAP after moving in. This picture was taken late afternoon when most of the sun has migrated over to the front of the house, so the natural light isn’t as bright and the emerald green color is really true to color in this photo particularly. 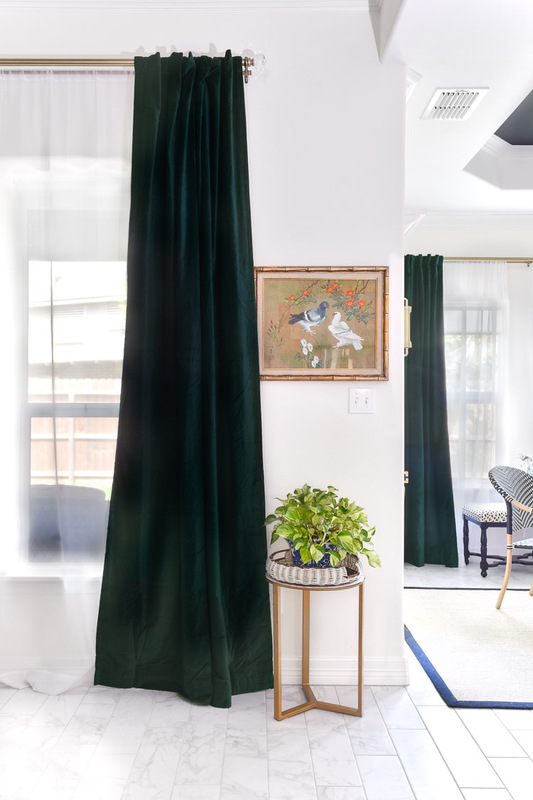 After buying returning over EIGHT sets curtains this year, I can safely say the Sheridan Velvet Green Curtain is an excellent choice if you’re in the market for emerald green curtains. 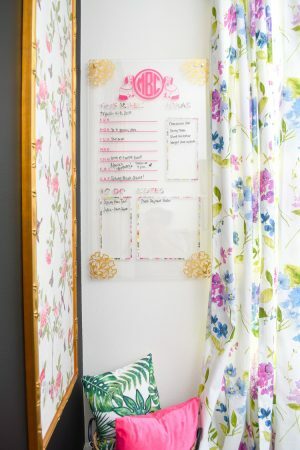 I adore the back tab feature since I love a casual pleated look, but they would also look beautiful with some of my favorite gold curtain clips like the ones I have on my antelope print curtains in my home office. They’re green blackout curtains, which is an extra plus in my book. 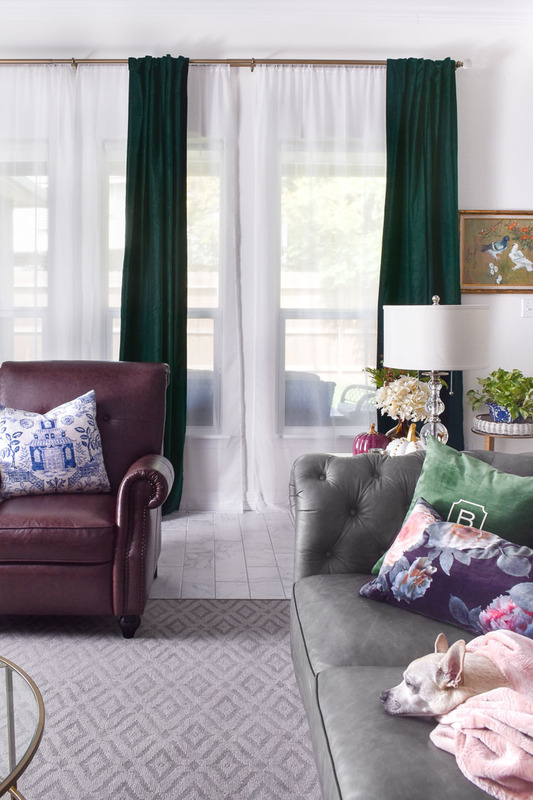 We have solar roller shades on all the windows, but these green curtains add an extra layer of light blocking which is perfect for a TV room or bedroom situation. The fabric is a lush velvet and drapes beautifully even though there’s not weights in the corner like some other panels tend to have. A quick steam got most of the wrinkles out. In the photo below, there’s light beaming in from the windows AND the patio door, which is why they’re extra green. 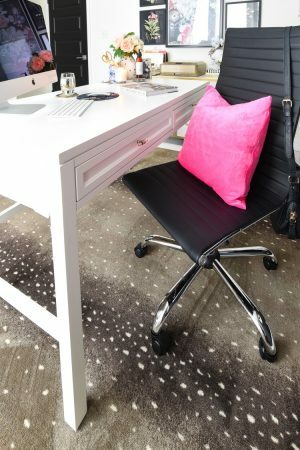 I’m telling you, natural light and time of day really play a factor into how things look in your home- especially bold colors! And a photo with the patio door blinds shut. Still green, but a bit darker. These beauties seem to only be sold at Pier 1’s website, and they also sell the gorgeous Sheridan Velvet Navy Curtains if you want blue. I may pick these up for our chinoiserie master bedroom because the white and grosgrain trim curtains I chose during the One Room Challenge let in so much light at night. 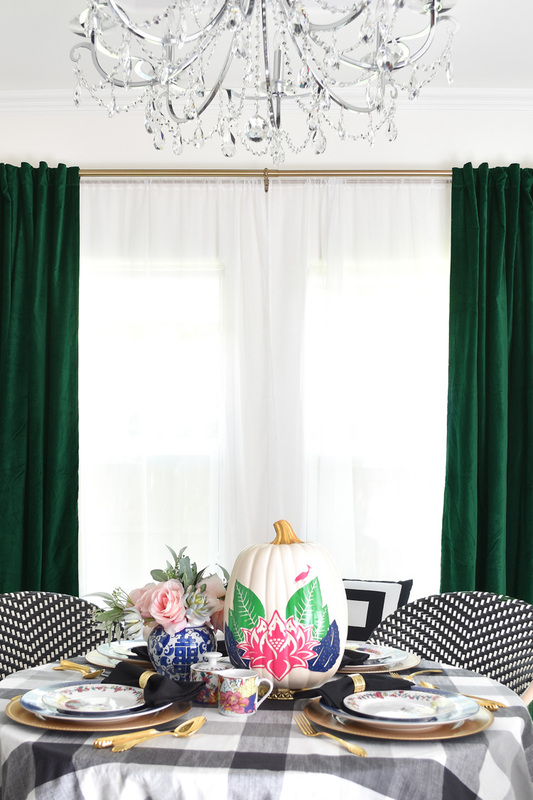 If you have any questions about the beautiful emerald green velvet curtains, please let me know. I know these purchases are no fun to make sight unseen, so I’m happy to help if you have questions. I love how these panels look in my living and dining spaces, and I hope you all do, too. My big master bedroom closet reveal is coming up on Wednesday, and I can’t wait for you all to see what $100 can do to a space. I love them! 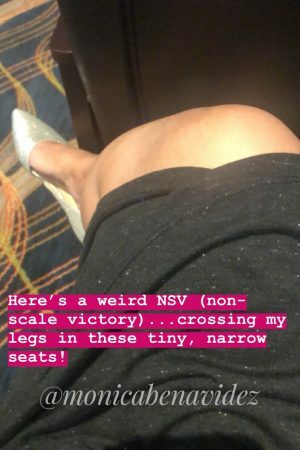 Are they sold as a pair or single panel? Hi! They’re sold as a single panel. 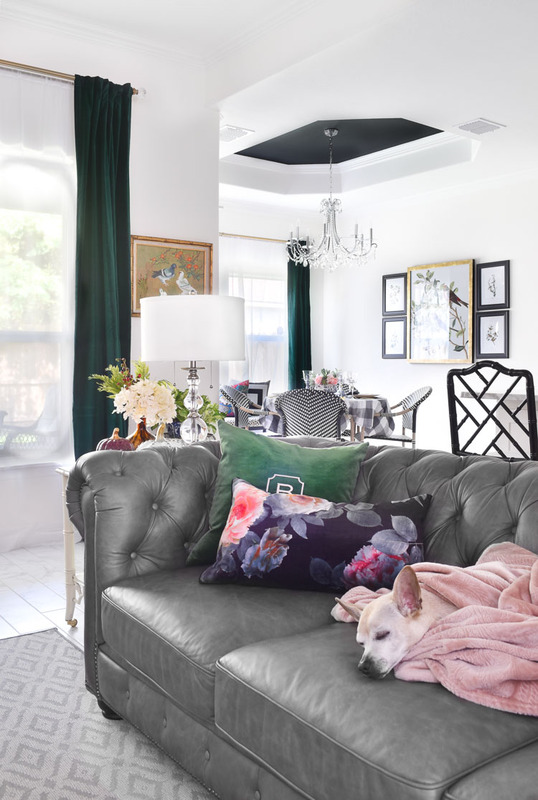 I love the green in your home, so pretty with the black and white color pallet you have going on. I agree, these can totally be a neutral for any color you want to add.